Welcome to our monthly newsletter! It is part of our website indigostreetpottery.com , which you can browse from this page if you click on the subjects in the header. We write here about our studio, arts events, projects, studios of our friends, garden musings, and whatever else strikes our fancy. Hope you enjoy it! Farraday Newsome has been creating unique ceramic art for more than 20 years. 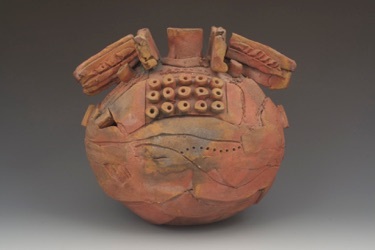 Based in Mesa, at the Indigo Street Pottery studio that she shares with her husband and fellow ceramic artist, Jeff Reich, Newsome uses red terra cotta clay to construct ornate teapots, pitchers, vases, bowls, lidded boxes and other similar objects. She applies a coat of glaze to her work, creates a collage of colorful images, and then covers the work with a permanent painterly layer of glass. 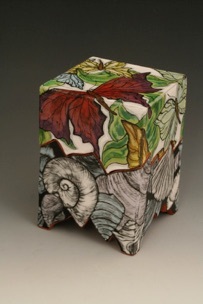 Newsome is currently showing one of her pieces at the Mesa Arts Center’s 31st Annual Contemporary Crafts exhibition. “The piece I am exhibiting is Fern Bird, Genetic Drift series. It is a sculpture of an upward gazing, large-billed bird glazed with a drift of ferns, bones, a shark tooth, egg clusters, a hand holding a hummingbird, an anatomical heart, dice and a watch,” Newsome explains. 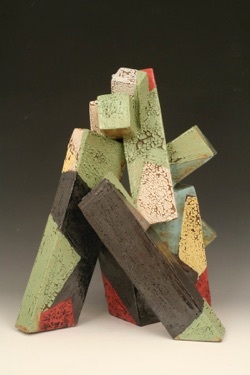 Newsome’s work, as well as Reich’s, will be on display at the crafts exhibition until March 14. Visit mesaartscenter.org for more information. Sorry to share sad news. University of Arizona Professor Emeritus Maurice Grossman passed away on Thursday, January 21, 2010. He started the crafts areas at the U of A. He taught ceramics there for 35 years until 1989 (I was his student from 1981-1985). He is the reason Jeff is working in clay. Maurice was 82. He will be missed. The link is to an article about his passing in the Arizona Daily Star. 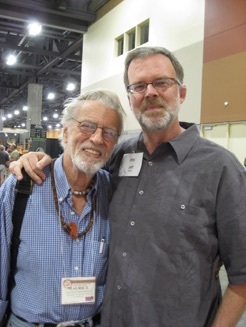 Maurice Grossman, a father, craftsman, activist and University of Arizona professor emeritus, died Thursday night of complications following heart surgery. 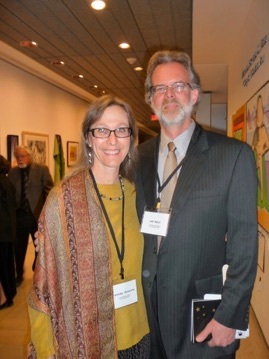 Farraday Newsome and Jeff Reich, pictured at left, at the 2010 Contemporary Forum Art Auction and Dinner at the Phoenix Art Museum. Photo courtesy of Chris Baxter. Jeff’s piece Winter Thorns, pictured above, was in the Live Auction. 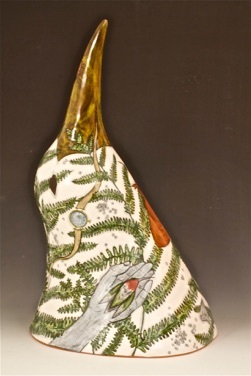 Farraday was a contributing artist in the Silent Auction part of the evening with her piece Promise of Moonlight, a glazed earthenware lidded box. Both Jeff and Farraday also made seven pieces each for the artwork table centerpieces this year, which were a new part of the Silent Auction. 2. 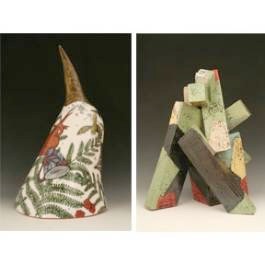 ASU Art Museum’s 9th Annual Self-guided Ceramic Studio Tour: February 27 & 28, 2010, 10am-4pm each day. This will be Indigo Street Pottery’s 8th year as a host site for this highly anticipated, free self-guided annual ceramic studio tour. We are site #15 this year. 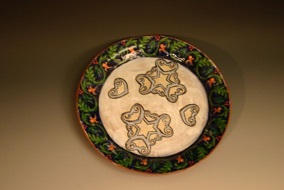 The tour is sponsored by the Arizona State University Art Museum Ceramic Research Center. Studio ceramists across the Valley of the Sun open their studios to hundreds of visitors. In addition to Jeff and Farraday’s work, our studio will host guest artists Linda Painter and Tacha Vosburgh. 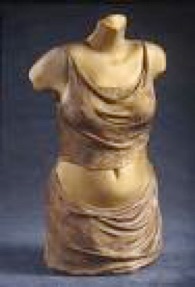 Tacha Vosburgh, Diana, metallic patina earthenware, 26x17x6”. Tacha is our other guest artist for the Ceramic Studio Tour. 6. 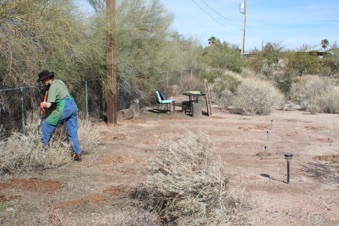 Garden Notes: Clearing land for the kitchen garden! This long-lived annual Mesa Arts Center show is now into its third decade. 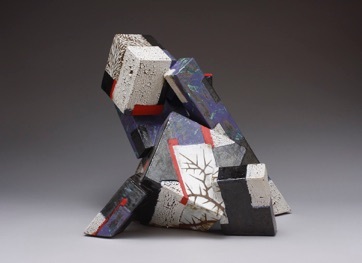 The exhibition showcases contemporary craft from across the country and is always juried by a prominent figure in the field of contemporary craft. 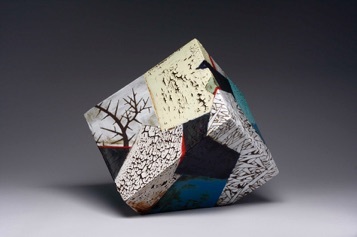 This year the juror is Jane Sauer, owner of the highly regarded Jane Sauer Gallery of Santa Fe, New Mexico. We are very pleased to both have work in the show this year. 6.Garden Note: Preparing to Build the Kitchen Garden Exclosure! 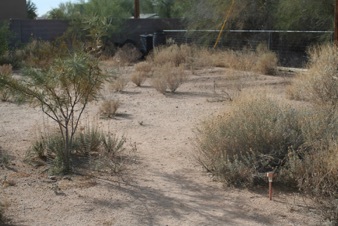 Eight years ago we tried to grow a vegetable garden here in the southwest corner of our backyard. It was a disaster! Three species of native squirrels, plus rabbits, and birds of all types ate leaves, stems and roots of everything that we tried to grow! Now we’ve designed a walk-in garden exclosure! Building will begin soon. We’ll post pictures as the project develops. Initially, here’s Farraday clearing brush to prepare for building.